Free 2017 Excel Calendars Templates. Yearly Calendar, Monthly Calendar and Weekly Calendars available. Calendars are in English with EU/UK defaults (Calendar Starts Mondays and set for printing on A4) and are blank and printable with print range pre-set. 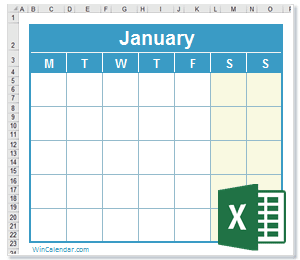 Calendar files are in new safer xlsx (macro-free) format. They are ideal for use as a spreadsheet calendar planner. All calendar files are also OpenOffice compatible. For following year calendars see:2018 Calendar in Excel Spreadsheet format, 2019 Calendar in Excel Spreadsheet format.